Colonial Athletic Association commissioner Tom Yeager called Southern Conference commissioner John Iamarino on Thursday to give him the professional courtesy of knowing that he would be contacting a few of Iamarino's member schools, widely believed to be Davidson and College of Charleston. Rafael Suanes/US Presswire CAA commissioner Tom Yeager has seen three member schools depart in recent weeks. "I appreciate that and I'm hoping to convince them [to stay]," Iamarino said. "We've got league meetings coming up [May 29-June 1 in Asheville, N.C.] and like every other conference, except the Ivy League, I suspect, 85 to 90 percent of the issues will be centered around realignment issues." The trickle-down effect of conference realignment seems to never end. The CAA loses anchor programs VCU (to the Atlantic 10 in the fall of 2012) and Old Dominion (to Conference USA in the fall of 2013). Those two moves came on the heels of Georgia State moving to the Sun Belt. "[The CAA] is such a Southern league I think they have to replace them with Southern teams," Delaware coach Monte Ross said. "I think they have to have that Southern flavor that the league is known for, and Davidson is a quality name and program." Said Towson coach Pat Skerry: "But we've got to get someone in the North, too. Stony Brook could be a viable option." Davidson and College of Charleston are the most obvious choices. Iamarino is well aware of the interest in his league's programs. But he said he has every intent of reminding the schools that they are in a competitive league and the proximity of the member schools offers low travel costs. "We're all within the geographic footprint," Iamarino said. "We avoid missing class time. The fans can travel to road games. That's why conferences were normally put together in the first place." Iamarino said the exit fee is $300,000 for notice of two years or more and $600,000 for less than two years. Charleston athletic director Joe Hull said the school doesn't have a position on the matter yet and said his school was happy in the Southern Conference. Davidson athletic director James Murphy said it wouldn't be appropriate to comment on conference affiliation. 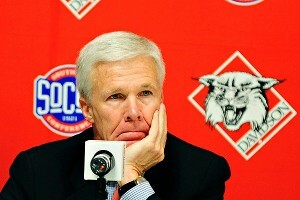 But head coach Bob McKillop was willing to speak. He said that 25 percent of the 1,800 students on campus play a sport, meaning that a move to the CAA affects a high percentage of the student population. Jeff Siner/Getty Images Davidson head coach Bob McKillop doesn't necessarily believe the Wildcats' prospects would be improved by a move out of the Southern Conference. "We have rigorous academic standards," McKillop said. "We've been to the NCAA tournament five times and the NIT twice in the past 10 years. We present a unique situation. But any decision will be made at the presidential level, not just a basketball decision." Translation: Davidson is doing just fine in the Southern and doesn't necessarily need to move to the CAA. It also means that their options may not be limited to the CAA. 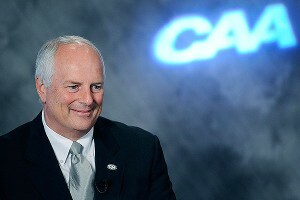 The CAA needs Davidson to beef up its membership and provide a consistent competitor for the likes of George Mason and Drexel. "VCU left the Colonial for the A-10, but who is to say the A-10 isn't going to change in the next three to four months? Who is to say the Big East or who is to say the Colonial won't change more?" McKillop said. "The dominoes have been blowing from the BCS. There are so many kinds of hypotheticals. Maybe James Madison and Delaware will go to the MAC in football or William & Mary to the Patriot." Northeastern coach Bill Coen said he's hopeful that there are no knee-jerk reactions in the CAA. "I think everyone needs to take a breath," Coen said. "You have to guard against doing something quickly that might not be a long-term solution." George Mason athletic director Tom O'Connor said the onus is on the remaining schools to continue to show a commitment to remaining in the league. "We all need to be proactive," O'Connor said. "You can't be stagnant. If you look internally and basketball is important to you then make sure you give the program all the tools to be successful." Georgia State and Old Dominion are in the Colonial next season, but league bylaws prohibit their participation in the conference tournament. Towson and UNC Wilmington are ineligible for the tournament based on poor academic scores; Towson is appealing. At this juncture, unless something changes, only seven schools would be eligible for the conference tournament in 2013. O'Connor said the bylaw preventing Old Dominion and Georgia State from postseason participation should be changed when the league meets next week. "My philosophy is that we should let the student-athletes play in championships," O'Connor said. "I think we can have conversations about our bylaws in the CAA." O'Connor said there should be discussion about suspending or doing away with the rule altogether. He said the bylaw was put in place 10 years ago but "the world has changed in a lot of different ways. Student-athletes should have an opportunity to participate in championships." If the membership can resolve the tournament issue, that might be the first step in trying to move ahead as one conference thinking about each other rather than the individual interests. The CAA has to stick together at this point, or it will quickly fade from relevance.